I love posing in front of camera, even my pose looked awkward sometime (or anytime, huh?). Quoted from Abraham Lincoln, said that: “There are no bad pictures; that's just how your face looks sometimes.” , and it is happened to me many times. I always ask the one who capture me, to capture more, because my face and my pose is not good enough. I admitted that I am not that photogenic in camera, but the most important is not how good / bad my looks there, but the moment in every capture that's impossible to reproduce. This time, Challenge Yourself asked us to complete the quote below, with an inspiring my layout. My layout is : Keep Calm and POSE !!! Keep Pose even the photographer said enough, lol. 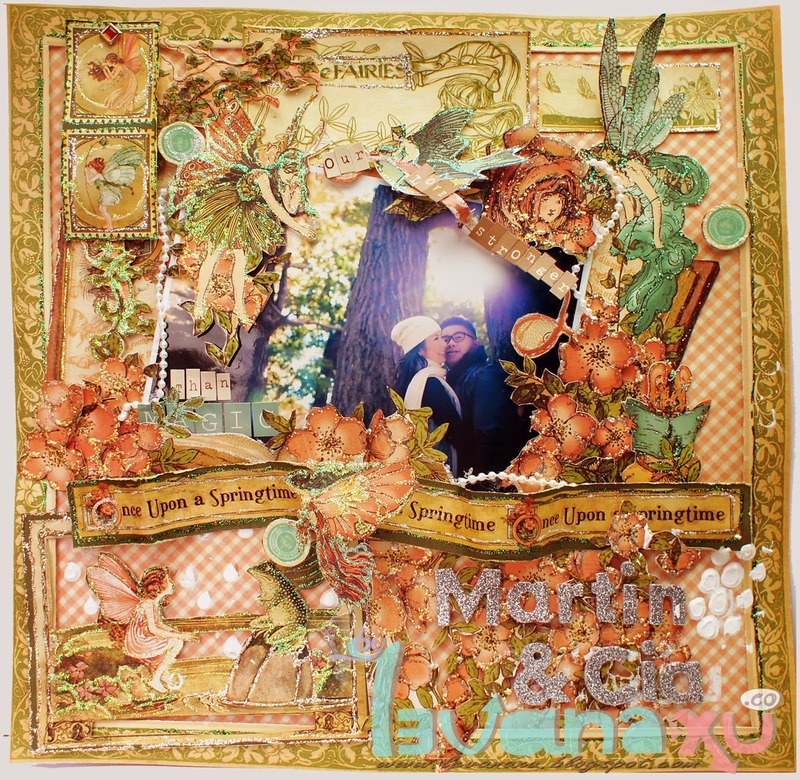 In combined with great color combo from CMS Challenge #58 , I made my layout from Pink Paislee : Spring Jubilee and Anna Griffin. The picture was taken in Strawberry Field in Bandung, Indonesia. Not only having experience in picking strawberry by self, but also can relaxing in the restaurant nearby the location. The picture is taken 3 years a go, and look at my cheek is so chubby at that moment, but the layout is brand new, adjusted with both current challenges. Well, if you visited this city, please kindly visit "Rumah Stroberi", and enjoy your time and lovely weather there. 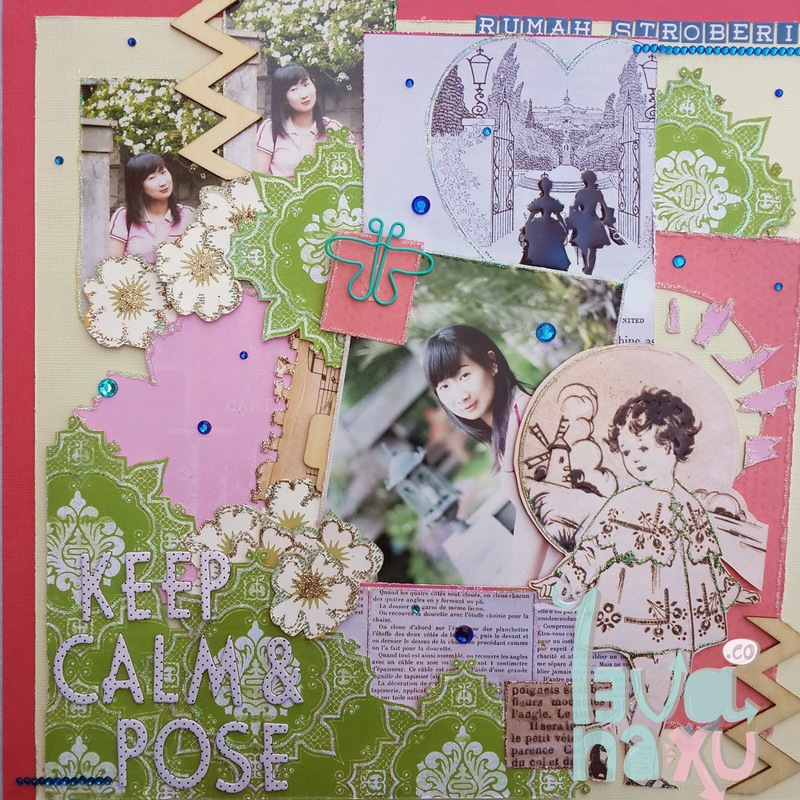 Paper: Bazzil papers, Pink Paisle: Spring Jubilee, Anna Grifin. 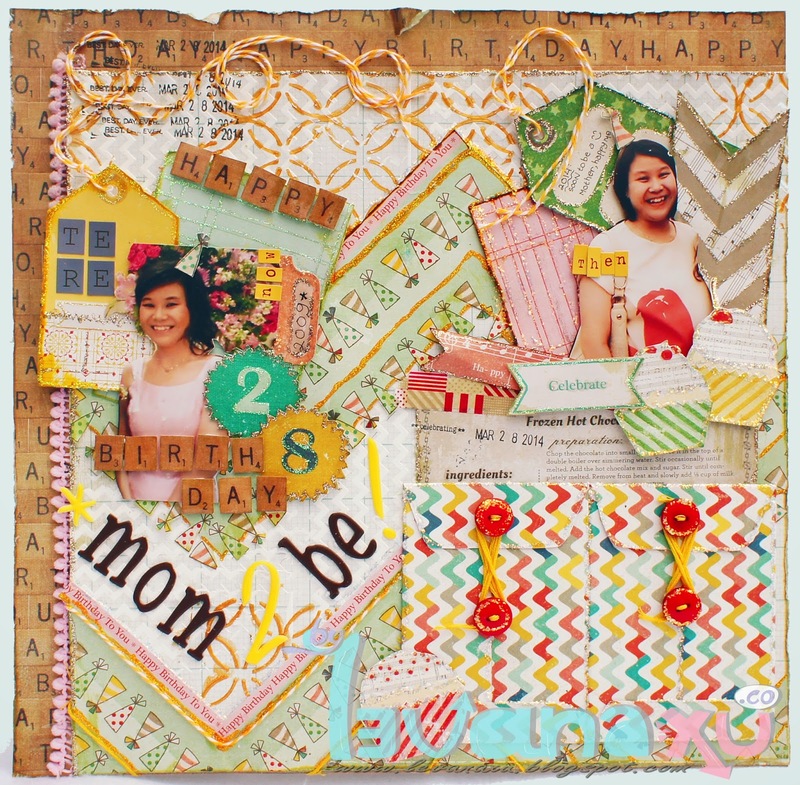 Embellishment: Bo Bunny Jewels, Studio Calico Wood Veneer : Darling Dear (Triangles) ; Wonderland (Tab), October Afternoon: Daily Flash - Deep Sea - Mini Alpha, Dear Lizzy: Thickers - RSVP / Confirmar Asistencia, Paperclip: Webster Pages - Postcard from Paris II. Birthday is the most special day in someone’s life. Especially for this woman, she is not longer a girl anymore. Entering her age at 28, she is not only celebrating additional of her age, but also God has sent her special gift in her womb. She's going to be a mother as well, what a blessed birthday.. I do really enjoying the scrapbook making progress, not because the one who gave me an order is one of my best friend, but also because I know the one who will receive my order. She is theresia Melanie, one of my ex coworker, when I was a banker. What a coincidence!! Happy to decorate every single layers in this page, and I hope the one who receive it would love it too.. This couple did prewedding photoshoot in Japan, and the scenery remind me of Twilight Saga. The scene of Edward Cullen met Bella in the forest. 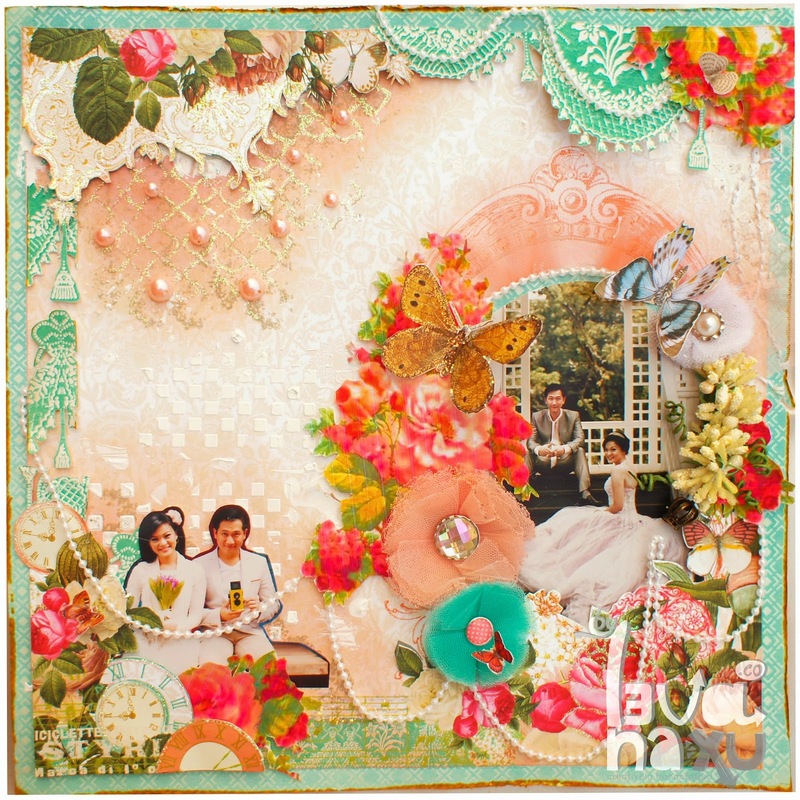 Therefore, this layout using my old collection from G45 - Once Upon a Spring Time, and in this layout I want to describe that when it comes to marriage that their love actually even stronger thatn any magic issue that is happened in fairytale..
Congratulation to Gracia Tanoto and Martin on your marriage, I wish you a day filled with cherished moments..
Happily bring out another layout from my favorite clients. This time, i turn a layout into garden of love. I heard that the preweding photoshoot was taken in Botanical Garden of Singapore, and it does really match with Webster Page collection : Postcard from Paris II. These collection so girly and I love it to the max, I even bought 2 sets for this line. To enhance more romatic atmosphere, I attach it with pearl (half pearl and peal chain), handmade lace flowers, and mixed-media effects. Entering the 4 months of marriage, and after this welcoming Valentine's day as well, I wish both of you love, appreciate, and complement each other. Make and keep your household as s garden of love.. The month, that is full of love. Yes, februari, indeed! When someone trust their design in me, and gave me some time to decor it, I would love to imagine any crazy and cheesy things, including this layout. All of a sudden, after making order of flanel flower for wedding handboquet, I rethink to reuse flanel as heart, and I dont want to waste the negative part, so I turn and reorganize it into background's layer. Both envelopes also handmade by me, it represent sthem as gift from God to each other.